Is our non-smoking quaint, charming, air conditioned,cozy 2 bedroom with a gas log fireplace and garden tub with a shower. 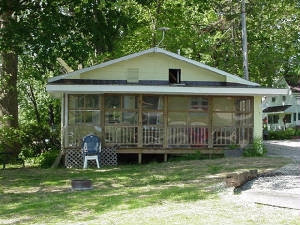 It has an open deck for your privacy and is nested next to the lake so you can enjoy the view from all rooms. Occupancy is based on 4 adults. kids are free. The perfect vacaction!Bring the whole family! Let the grown kids and their kids stay in one of the larger cottages [ 2&3] and the less inclined to the noise or pace, stay in #1. You can park at the door and unload your personnel things. The dock is but a few steps away.This 2 bdr. 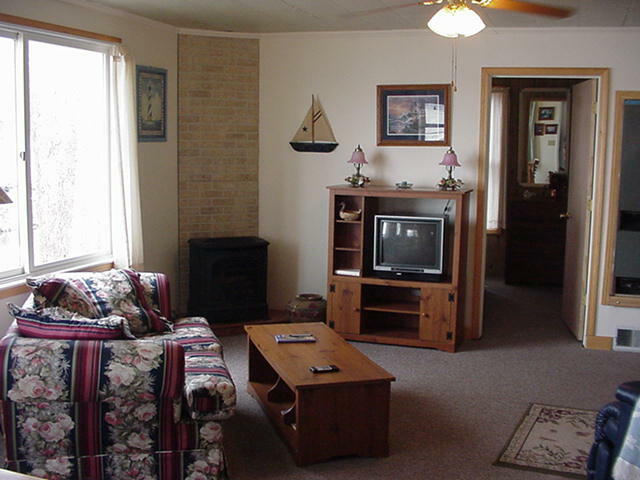 cottage is elderly and handicapped friendly, you will catch fish off the dock.However we can't keep the young at heart away, with the gas log fireplace,privacy and the garden tub! ENJOY! We have updated the kitchen, it now has a dishwasher.